Goodreads: Tara thought she was finally settling down when she married charming, handsome Dr. Cavin Lattimore, but life seems to be only getting more complicated. During the honeymoon, Tara’s niece Kayla moved into their Lake Tahoe home and quickly hooked up with Cavin’s manipulative, seductive son Eli. In a matter of weeks, Tara has gone from rich, single San Francisco professional to suburban housewife managing her niece’s emotional ups-and-downs, as well as her stepson’s continuing overt advances. Adding to the family drama, Tara’s younger sister Melody is going through a serious marital breakdown. During a heated argument, her husband Graham insists he and Tara once had an affair. Despite Tara’s vehement denials, Melody is desperate to find the truth. Enter Cavin’s gorgeous ex-girlfriend, Sophia, whose sudden relocation to Lake Tahoe is causing further shake-up. When Sophia is found murdered, police quickly narrow the list of suspects to Tara, Cavin, Eli, and Kayla. All four have motive. All four have lost themselves in a complicated web of lust, jealousy, and betrayal. But how far was one of them actually willing to go? Tara has always considered herself a tough, self-made woman, on her own since she was a teen after a childhood defined by poverty, abuse, and neglect. For years, she suffered the sins of others. But that doesn’t mean she never committed her own. Are the sins of the past about to catch up with her? Kritters Thoughts: SPOILERS throughout this review of the first book and this book also. It was too hard to share my feelings without telling you the ins and outs of why I had these feelings. In the second book in this series, Tara Lattimore has almost finished moving into her husband's home and combining their lives. The trust issues that are in book one continue in this book and added to that is family drama when some s*&t goes down with her and her sister. The stuff that goes on with her sister made me sad to read because I liked that her sister was the one person in book two that you could love and trust and I didn't want that taken away from her. The second book continued with the frustrating back and forth between believing either of the male characters and not believing the other. I didn't want to spoil yesterday's review and state that I ended that book with no feelings resolved and unfortunately this book gave me even more frustration. Beyond the trust issues that continued, the main death that is featured in the synopsis happens in the last 50 pages and then all things are resolved in a clumsy way. I felt as though 80% of the book was a close repeat to the first book and then you have all of the drama and action happen in the close of the book and I wanted that to happen earlier and have more build up and intrigue. 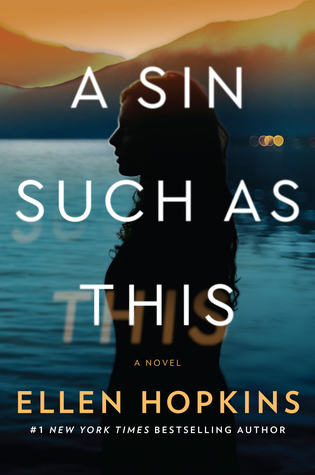 Through all of this I am still an Ellen Hopkins fan, but I will just keep to reading her books that are full of creative and inventive poetry that seem to create such full and fantastic stories.